At last! Some proper writing news to report. This week I have sent Particular Stupidities (R&M File #5) off to the gentleman who proofreads my books. I wasn’t sorry to see it go. It’s been hanging around at home for a few weeks – or is it months? – while I’ve dithered over things, left it, gone back to it, read it again, left it, gone back to it, read it again ad nauseum. But I am happy with it. That’s the main thing. I really am happy with it. This is my tenth book. With the other nine I have just released them with a bit of blogging and tweetiing and posting on Facebook – wiped their bums and hoped for the best. I’m determined to make more of an effort shouting about this one prior to its release. I need to DO something by way of promotion over and above the usual. Every week – make that every day – there are dozens of new books being released as well as back catalogues of older books that have been brought out as ebooks from the original print version. The competition to be noticed has never been fiercer. I have not tried the pre-order option with Amazon, but this time I think I might. As I understand it, the advantage for authors with this scheme is that an interested reader can click on a button – job done – and then get the ebook automatically delivered on the day of release as opposed to trying to remember the publication date and forgetting all about it. This way authors don’t lose readers and downloads. When I tweet and blog and post on Facebook readers who notice and are interested will be able to click that pre-order button and forget about it until the day the book shows up on their Kindle. Everyone’s happy. Something else that occurs to me – why didn’t I consider using the pre-order function before? Dunce. I was contacted by a very nice lady last week to see if I would be interested in completing an online interview for a magazine that has an interest in writers living and working outside their home nations. Naturally, I agreed. I spent much of the weekend staring at the blank screen trying to answer the questions. It was the closest I’ve come to experiencing writer’s block. I had no idea that I knew so little about my writing process. It was a bit of an eye-opener. Here are the questions. I have a couple of writing buddies. I wonder how they would have tackled these. So… what now? I remember reporting here recently that I was twenty-five thousand words into R&M#6 before I broke off for something I’ve forgotten. And then I started B&C #3 with an idea for an opening chapter. (I since took that up to ten-thousand words with a bit of a spurt. Another good start in the bank, I feel.) For now back to Romney and Marsh. In B&C #3 David Booker laments the anti-social nature of jet-skis, which are permitted by local bylaws to spoil everything for everyone who wants to sit in peace and quiet and enjoy the view from Dymchurch seawall. As luck would have it, I was out with my son walking by the seaside in Istanbul last weekend when a couple of jet-skis came skimming noisily over the water in our general direction. They are an uncommon sight here. My son and I had been throwing stones at a football that was floating in the sea about twenty yards out. No one seemed to be claiming it. One of the jet-ski pilots saw the ball, diverted to it, stopped, fished it out of the sea, motored over to us and threw the ball to us with a smile. He thought we’d lost it. It was a good ball. And new. How kind that was. Life is a bit strange sometimes. Vanuatu, Vanuatu, wherefore art thou Vanuatu? Sunday evening it was with a start that I realised I hadn’t written a blog post last week. I’m still not sure why. (It might have something to do with getting steamed on Friday night and consequently misplacing Saturday.) OK nothing happened in my writer’s life but that’s never stopped me from turning out a thousand words of forgettable ramblings. So that I don’t miss this week’s deadline I’m writing this one early. I have been busy. I’m still wondering (and worrying) why I can’t find anything to change in Particular Stupidities R&M#5. There are only two possible answers to that: 1) It’s as good as it can be. 2) It’s not but I can’t see why. Maybe just one more look. Yesterday, Monday, I was struck with an idea for the opening of Booker & Cash #3. And with the idea came a good title: Waifs and Strays. Despite other pressing writing commitments, I couldn’t resist running off three thousand words for the first chapter and I like it. It’s nice to have a start under the belt, something to pick up when the opportunity presents itself. It was also great to get in touch with Jo and David again. I miss them. I miss Acer too. But I have R&M#6 that I must get back to. But there is a good reason that I now have to consider these evils. Pretty soon I’m going to be writing for more than just because I enjoy it. More on that in a future post. Now and again my WordPress stats throw up an interesting gobbet of information. Today my blog has been viewed from Vanuatu – another of those far flung territories that I’ve never heard of. And I bet that 99% of people who hear the name will have the same reaction as me. The ground floor of the apartment building next door is occupied by a hairdressers. They have an African Grey parrot. Because the weather is fine the bird is outside in its cage during the day. I feel very sad when I see a caged bird. But there is nothing I can do about it. The bird in question makes a lot of noise. The noise is not unpleasant. It doesn’t screech. It continually mimics the calls of other exotic birds it must have had some significant contact with. (The noises don’t resemble anything I’ve heard in Istanbul.) It’s nice to have the window open behind me as I write. I hope the bird is not terribly unhappy. On reflection, that final paragraph seems a bit allegorical. Am I a caged bird? Aren’t we all? R&M File #5 – A criminal study in aromatherapy. My Vancouver jaunt is but a distant happy memory. My sleep patterns have returned to normal. My taste buds are in hibernation. I’m regular again. And my respiratory condition (known locally as Istanbul lung) is back. This week I’ve knuckled down to some serious and intense work on Particular Stupidities R&M#5. I’m feeling confident that it hangs together well and that it is a worthy addition to the R&M Files. That’s really as much as I can ever hope for from new books in the series. I’ve been through it a couple of times and other than tightening up a sentence here and a paragraph there and fixing those English errors that I can see I don’t honestly know what else I can do with it. I’m a little concerned to be so… satisfied with it so quickly because usually I feel the need to go through my books at least five times before I’m approaching happy with them. It’s strangely worrisome that I feel good about it with so few run throughs. Maybe I’ll leave it a week and read it again. Just to be sure. 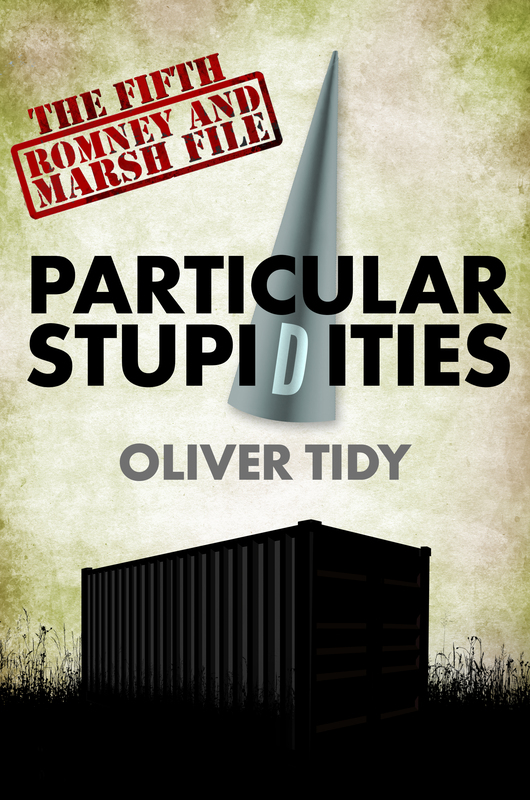 The Particular Stupidities that blight Mankind litter this fifth Romney and Marsh File, which sees Dover CID taken to the outskirts of their jurisdiction, the edge of reason and the verge of self-destruction. The sea and country air of the district has competition in this criminal study in aromatherapy. The pong of putrefied remains, the distillation of duplicity, the odour of opposition and the infusion of inanity combine to produce a pungent bouquet to clear the most congested of blocked nasal passages. Could clear my airways so. Can match thine landscapes, oh. Has shaken and moved me like you. In case you haven’t worked it out yet, I spent last week mostly in North Vancouver. Vancouver’s in a region of Canada called British Columbia. The local vehicle licence plates refer to it as ‘Beautiful British Columbia’, and it is. It’s other things too. If I were half my age I’d be applying for working visas instead of writing this. Drivers ALWAYS stopped and indicated that I should cross the road in front of their vehicles, even when I wasn’t using a designated crossing. I don’t carry a white stick or walk a Labrador. (Having lived in Istanbul for a few years I have learned to shy away from crossing roads with moving vehicles around. You just don’t do that sort of thing here unless you’re feeling suicidal or drunk.) Not once did I nearly get run over on the pavement by something on two wheels with an engine. And Vancouver’s pavements are wide and litter, faeces, parked motor vehicle and tripping hazard free. The people who worked in the customer service industry were friendly and polite and smiley and helpful. And other customers waited their turn to be served. The elbow shaped bruises on my upper arms have almost completely disappeared. Public transport was excellent: frequent, cheap and clean and (you probably won’t believe this) when passengers get off the bus they often call out their thanks to the driver. Thanks to the driver! Honestly, it’s like Walt Disney had one of Martin Luther King’s dreams and went into town planning. The great outdoors is on the doorstep and in the winter the local mountains are havens for winter sports enthusiasts. I had some great hikes in stunning scenery, but to really get an idea of what the place has to offer, a twenty minute seaplane flight laid everything out perfectly – a buffet of British Columbian delights. I stayed at a place called the Lonsdale Quay Hotel. The room and facilities were more than adequate. But the real bonus of this location was that the bottom two floors of the building are occupied by eateries and drinkeries of the organicky, home-producey, home-madey and bespokey style. Nothing franchised. I’ll name and reference three of them that I used almost on a daily business. There were others: a brilliant bakers, a super smoothie maker and a bumper breakfast provider among them. The hotel is situated right on the edge of the channel of water that divides Vancouver’s south and north shores. It’s a busy shipping channel, which reminded me a lot of Istanbul’s Bosphorus, except that I never saw one empty plastic bottle, discarded carrier bag or dead body floating in the water. I did see an otter, a heron and a couple of seals though (all alive and doing their thing). Much nicer. Talking of nice and nicer, I’ve come away from Vancouver believing that there has to be a correlation between people’s behaviour towards one another and the physical characteristics of the cities they inhabit. I returned to Istanbul full of good intentions to be nicer to everyone, to smile at strangers, to say hi and after you and thank you (in Turkish) more often. It lasted as long as it took for me to try to get off the Metro with my suitcase. As soon as those doors opened I was stampeded, knocked to the floor and trampled on by travellers who weren’t interested in standing aside and waiting the seconds it would take for travellers to disembark first. For anyone who’s reading this because they want news of my writing, my apologies. My news is: I took my hard copy of R&M#5 with me to work on but I didn’t even finish reading it through once. In fact I didn’t even get half-way through it. It’s not that it’s bad but Vancouver kept me distracted and tired (especially that brewery with bar.) I might have got some work done on it in the evenings, but my daughter – the reason I was visiting North Vancouver – took one look at my hotel room with two queen sized beds facing a 42” plasma TV with a digital package and decided to move in for the week. (After seeing her digs I can understand why.) We stayed up every night watching crap on the food channel and loved it!